Electricity- A commodity we just cannot live without! Yes it is available in abundance today, for a price but this will not be the case always. The cost of electricity has been on the rise, thanks to extensive use and decrease in easy availability of the same. Since natural resources are burnt to produce electricity, the depletion in resources is increasing the price of this much needed commodity. Today, solar energy is gaining importance and popularity (simply because it is an economical way of producing electricity) – in abundance and the sun is ready to generate enormous amount of heat. It is not just at homes or offices but solar energy can be used even on the move. There are a number of solar panels that are available, to be used in trailers, RVs, boats apart from sheds and cabins. Though the initial investment is high, the returns are great and totally worth the investment. 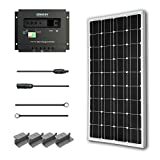 If you are looking to get yourself a solar panel and want to start on the eco-friendly run, this Renogy 100W starter kit is for you. Perfect for many off grid applications like boats, trailers and RVs, this kit has a sea of benefits to offer you. Monitor Power Control – This kit uses Pulse Width Modulation technology, which can control the power supplied to the various appliances. As you can connect this kit to a variety of appliances, you need to monitor the power supplied as the requirement for each will vary. This technology enables you to control the power supplied to your electrical appliances, thus ensuring they don’t get ruined due to over or under supply. Expandable Power – The Renogy flexible solar panel can supply 100watts of energy and can be expanded up to 400 watts when you have an increase in requirement. Tools – When you have to install a solar panel, there are a number of tools that will be required to get the job done efficiently. The Renogy 100W kit comes with all the necessary tools, thereby making your job easier. You don’t have to hunt for the specific tools, when you are half way through the installation. All you have to buy is the battery. The tools included are a Renogy 100W 12V Monocrystalline Solar Panel, a 30A PWM Wanderer Charge Controller, a 20ft 10AWG MC4 Adaptor Kit, an 8ft 10AWG Tray Cable, and a set of Z-brackets. Safety – This Renogy 100 Watt suitcase comes with LED indicators, so that you can you can keep track of various aspects of the starter kit. It also has a negative ground controller, which enables you to use it for a number of off grid applications. If you are using this kit on a vehicle which has a battery that is negative on the chassis, the negative ground controller will ensure your safety. Monocrystalline Solar Panels – Made out of pure silicon crystal, this panel is highly efficient, economic and lasts for a very long time. This panel has a higher resistance to heat and can produce more electricity within a limited space. Controller Not Sufficient – The Renogy charge controller that comes with this kit is not sufficient to produce enough electricity. You will have to spend a little extra and buy a better charger to get the best out of the kit and also to ensure there is no system failure. Expensive – Monocrystalline solar panels are expensive as the manufacturing process is quite complicated. This makes the entire panel more expensive than some of the alternates in the market. Wires Not Colour Coded – Unlike many of the electrical appliances that has wires in different colours to help you differentiate, this solar panel kit has all the wires in black colour. Though the wires have a marking on them, these markings won’t be visible once connected through the system. Unlike many panels that come with a fixed power supply, this panel’s control charger enables you to expand the power as and when required. This makes it versatile and useful even for heavier needs. There are many cheaper alternatives in the market that do not use monocrystalline panels, but these panels produce more energy from a small body, thus generating more electricity even when the panel is as small as the roof of your truck. You can use this grid even on the move. Just mount it on your trailer or truck and enjoy uninterrupted power supply when you hit the roads. A perfect solution for those long camping and road trips. You don’t have to hunt for the various tools that will be required to install the appliance. Everything comes with the main package and saves you a lot of time and energy. This solar panel kit is compatible with a variety of batteries like flooded, sealed or even gel batteries. This saves you a lot of money as you need not invest in a specific battery that will suit only this panel and discard it when you decide to change the panel. The charge controller has been upgraded, for a better and safer performance. This allows you to get the best out of your panel. It is very compact and measures only 47×1.5×20.9 inches and weighs a mere 19.8 pounds, thus making it easily portable. Renogy is very famous worldwide for its solar panels. The company comes up with innovative solutions to get the best out of your solar panels. With this solar panel, you can enjoy economical and uninterrupted power supply, be it in your cabin or on your truck. Carry all those gadgets you cannot live without and ensure they are always charged and ready to be used, with the help of this panel. A compact sized, light weight panel, just right for your electrical needs on the move. Become eco friendly without creating a hole in your pocket. Convenience and productivity at its best, this panel is just what you need to start your eco friendly journey. When you venture into something new, you need the right equipment so that you are encouraged to continue your journey on the same path. Invest in the Renogy 100 Watts 12 Volts starter kit made of Monocrystalline solar panel, today and utilize the sun’s energy to the limit. You can get many Renogy coupons that will reduce your financial investment and make this panel a much better choice than any other in the market.